The quiet of yesterday was pounded into distant memory when the Germans launched a fierce bombardment on the troops in Ploegsteert Wood at 2:30am. Shellfire increased throughout the early hours until the Germans attacked at around 6:30am. Reports came back that they had broken through the Worcesters’ lines. They being two Saxon battalions and two Jäger companies, according to a captured Saxon officer. The situation became so bleak that 3rd Division sent two battalions to Le Bizet, just south of Ploegsteert village and the Argyll and Sutherland Highlanders were pushed up into Ploegsteert itself to steady the line. I am not going to attempt to decipher the days’ fighting as there is no time here to do it. Suffice to say that the fighting was confused by the heavy woodland, by the mist and by so many different units fighting in poorly dug trenches. Casualties were heavy, especially on the easterly edge of the woods with the Worcesters, the Rifle Brigade and the Hampshires suffering most. It appears that the Dorsets enjoyed a relatively quiet sector, reporting “little activity by either French or Germans”. Let’s go back to the letter of the 5th November. Here’s a rather pathetic list of Frank’s worldly possessions. Till I have forgot to tell you before, and that is that all my clothes are at Jessies home, two lots that basket and a box, I was going to send them home but we never had time wasn’t allowed out and we had to get rid of them at once. I had just bought another suit a navy blue a lovely one it cost 55/- and I only put it on twice, bowler shirts ties, socks collars watch Bank Book with 5/- in it, your hair brushes, overcoat, in fact every think. Frank is a young man who loves to gad about town and likes looking the part. In 1914 55 shillings is quite a lot of money to spend on a suit. A private soldier in a line infantry regiment only earned a shilling a day. Frank was being paid 1 shilling and sixpence per day by 1913. That’s over one year’s pay for a suit. When British men were demobbed in 1918 they were offered 52 shillings or a plain suit and clothing prices had more than doubled by then. I wonder if this photograph of Frank shows his new suit? 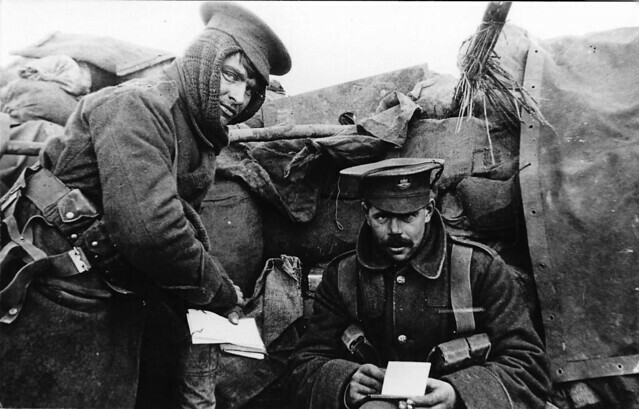 It was probably the photograph taken after a few drinks on the 1st June 1914 if you work back from the letter he sent to Mabel on the 8th June. I’d love to have the originals or even better scans but this is all I’ve got for now. The photograph was taken at Mercer Bros Studio in Ann Street, Belfast. Yes I hear from Jess she sent me out a parcel not long ago, and her brother dropped me a few lines, as well, yes poor Jessies getting on alright, just as the War started I was getting on alright, at her home for I used to go round for dinner and Tea on Sundays, and supper in the week, only the old lady didn’t drink she hates the sight of it. This sentence is rather rueful. Frank is missing his home comforts back in Belfast and we see for the first time that his relationship with Jess is really quite serious. I still haven’t found out who Jess is. All we know is that she lived at 14 Maralin Street, Belfast in 1914, has a brother and a mother who’s still alive. For now, the trail has gone cold.